MED e-care’s eMAR & eTAR offers clients an innovative and integrated solution to medication & Treatment administration, with convenient availability in web-based and offline (syncable) application. This application provides staff with secure and convenient access to resident medication records, allowing for real-time recording, collection and reporting of resident data. The primary function of eMAR/eTAR is to electronically track and record resident administration of medication and treatments. In other words, it electronically replaces paper MARs and TARs. The software tracks the order and delivery of medication with ease and convenience, generating any number of reports with a single click of a mouse. eMAR/eTAR ensures the highest level of safety and security protection for both resident and staff with security features, such as patient photo and bar code technology. Bar code technology provides nursing staff with instantaneous access to resident and medication/treatment information. In addition to saving staff at minimum, 5 manual clicks, bar coding provides automated reconciliation of a resident’s next scheduled medications/treatments with what is physically existent in the pouch. Scanning the 2D bar code also reduces the time needed to record the drug information, and more importantly, reduce the chance of errors in transcribing this information manually into our software. Additionally, using an automated validation check of the medication/treatment given to the resident accounts for a reduction in the most common source of medication/treatment errors – during the point of administration. The administration of medications and treatments are recorded in real-time. PRN and vitals follow-up reminders eliminate missed or late medication. 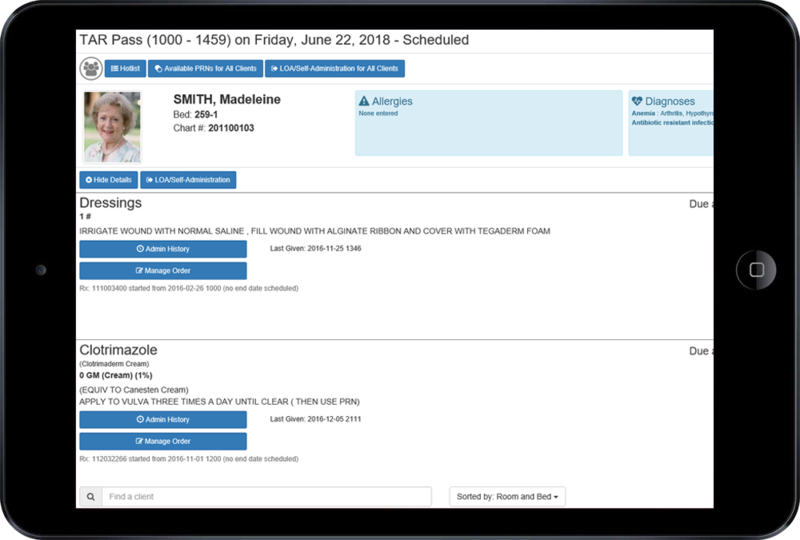 Staff have the ability to manage medication/treatment orders directly from the eMAR/eTAR administration screen; medications can be discontinued, reordered, or placed on hold during a MED Pass. Waste dosage is automatically updated for the facility and notification is sent to the pharmacy if replacement drugs were required. Able to add contingency medications/treatment when needed to eMAR/eTAR on an emergency and notification basis. One-step process of STAT order and signature to provide time saving measures and notification. Improve resident safety and drug accuracy by reducing medication administration errors. Studies have shown that medication errors can be reduced by up to 87% once a facility implements an eMAR. By way of a secure, closed-loop interface with Pharmacy medication orders are linked directly to Pharmacy. Inventory levels are automatically updated and medications can be ordered, discontinued or placed on hold electronically during the MED pass. With the increased efficiencies introduced by eMAR, MED passes can be reduced by 30%. All relevant resident information is conveniently displayed on the eMAR administration screen making it easier for nursing staff to verify the 5 Rights: Right Drug, Right Resident, Right Dose, Right Route, Right Time. Residents’ medical conditions and allergies are listed with resident MARs and TARs. Nursing staff receive system reminders alerting them to time-sensitive medications, treatments, and follow-ups. eMAR allows staff to review or add documentation during or after administration, which includes the ability to view and record bio-test results and PRNs. Staff are given the tools to effectively manage emergency stock medication and medical directives. Get indicators of care for your facility in seconds! With just a few clicks, generate audit reports and statistics such as medication inventory levels and nurse shift information. There is no need to sift through piles of paperwork. MED e-care’s eMAR/eTAR was designed with healthcare best-practices in mind. We wanted healthcare staff to have some piece of mind knowing that there is an electronic system supporting them through the sensitive task of medication/treatment administration. Eliminating errors, speeding up the time documenting and assisting in decision-making are just a few of the benefits of using MED e-care’s eMAR and eTAR.